Since the Second World War, Europe has provided a safe haven for repatriates leaving former colonies, as well as those fleeing war in countries like former Yugoslavia and more recently, Afghanistan and Syria. Many European countries see more people arrive than depart, and net migration is especially high in the economic heartland of Western Europe. Germany, the country with the most positive migration balance, had a surplus of roughly 1.2 million people in 2015, meaning than 1.2 million more people moved to Germany than moved away from Germany. That year, the United Kingdom and Austria had a surplus of approximately 400,000 and 123,000 respectively. On the other end of the spectrum, Greece saw roughly 35,600 more people depart than arrive. Romania, with a net migration balance of -35,000, was faring only slightly better. When looking at the outward migration flows, it shows that over 400,000 people left Spain in 2014, making the Spanish Europe’s most frequent emigrants. Germany, the country with the highest net migration, also had the second-highest emigration numbers that year, with nearly 325,000 people leaving Germany in 2014. That Germany’s net migration is still positive can only be explained by the even larger influx of people. 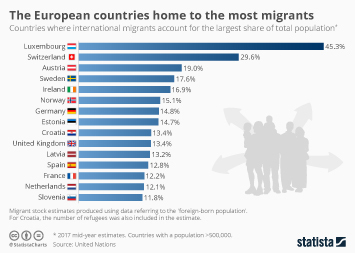 Only 476 people left Liechtenstein in 2014, but considering the small size of the country it is not surprising that Liechtenstein came last in the ranking of the European migration outflow in 2014. Every year hundreds of thousands of refugees arrive in Europe, hoping for a better future. In 2016, Germany alone received nearly 700,000 asylum applications. In total, European Union countries received nearly 1.2 million asylum requests that year. At the same time, over 300,000 people received return decisions, an increase of nearly 20,000 in comparison to 2015. In 2017, most illegal refugees arrived via the Central Mediterranean route (Italy and Malta). In total, 118,962 people used this route that year. The Eastern Balkan route was a lot less popular, with 42,305 illegal arrivals. Most of those using the Eastern Mediterranean route came by sea in 2017, but some also came by land. The EU-Turkey deal was closed between the European Union and Turkey to close this dangerous route in March 2016, and illegal migration decreased significantly via this route since then. With so much media focus on armed conflicts and economic migration, one could easily forget that those are not the only reasons for migration to Europe. According to Italian sources other important reasons for migration for individuals from non-EU countries in 2015 included studies (23,030 people) and others, such as religion or health (19,811 people). The Netherlands alone saw the international student community double between 2007 and 2017, from roughly 44,000 in 2007 to nearly 90,000 today.